A blog post here about a scam where people are sent to a site selling false anti-virus software demonstrated to me how introducing address validation to the Internet Corporation for Assigned Names and Numbers (ICANN) Whois database could help in the fight again such scammers. The blog documents the websites through which the user is sent by the scam, and shows the whois entry for each of the sites. I don't think there is a Booth Street in Edmonton, but the real giveaway is the 6-digit postal code - not even close to a Canadian format. Again, not a valid Brazilian postal code format. An English-language address, in Melbourne, but in Russia? And with a 5-digit postal code? Shouldn't there be alarm bells going off somewhere about this obvious fakery?? Wouldn't we be better served if ICANN introduced validation, ranging from simple postal code format validation, through "can this address be in that country" validation right down to address-level validation, into their web registration database? I'm not fool enough to think that having to add a real address would stop scammers, but it would slow them down, as they'd have to find somebodys else's real address to add. Furthermore, having a database of only real addresses (i.e. of high data quality) instead of the current hodge-podge based on trust, would enable analysis of the data to improve identification of potential criminal activity. The current whois database may be fit for ICANN's purposes, but data quality it ain't. I was sent the link here, which shows a scan from a publication which appears to come from the car manufacturers Citroen and to date from 2009. All looks fine until one looks more closely at the Balkans on this map. Slovenia has expanded southwards, absorbing Croatia proper (including the capital, Zagreb) and Istria. Croatia has become but a rump of its former self, but has absorbed about half of Bosnia-Hercegovina, which is but a memory, as it's nowhere to be found on this map. Citroen have succeeded where Slobodan Milosovic failed, and created a greater Serbia, including the Croatian area of Slavonia (and thus giving it a common border with Slovenia), Montenegro, Kosovo and a big chunk of Bosnia. In fact, only Macedonia is shown correctly, and even then the border has been drawn very approximately. In fact, it looks as though somebody has taken a pre-1991 map showing Yugoslavia, and drawn in some borders where they think they might be, clearly more in hope than in expectation. Is a reminder needed of the number of people who died or were pushed out of their homes to fix the current borders of those countries? 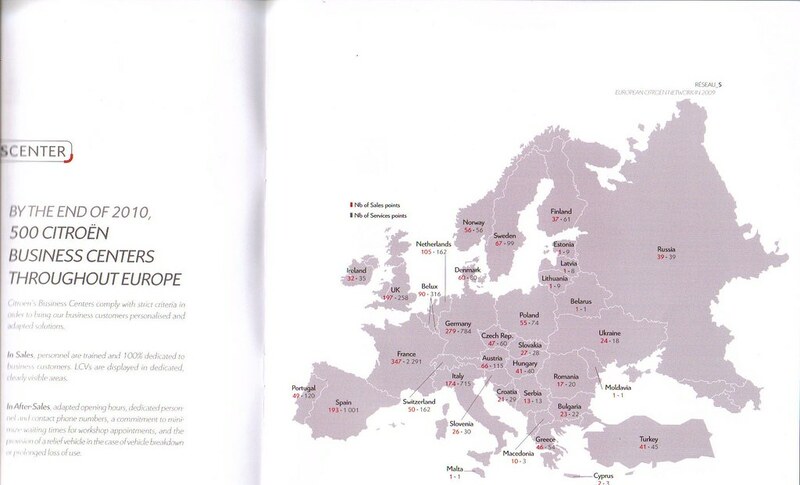 Should Citroen be thoroughly ashamed of publishing such a map? Should road users everywhere be worried that the level of quality control during the manufacture of their cars matches that applied to their publications? I do wonder how such errors get through the net - are people too lazy to reach for an atlas?